A Russian Proton rocket launches toward space carrying the Telkom 3 and Express MD2 satellites on Aug. 6, 2012 from Baikonur Cosmodrome in Kazakhstan. The rocket suffered a third stage failure during the ill-fated mission. An upper stage mishap on Monday stranded Russian and Indonesian communications satellites in the wrong orbit after liftoff from Kazakhstan aboard a Proton rocket. The satellites were left in a lower-than-planned orbit when a Breeze M upper stage prematurely shut down. The hydrazine-fueled rocket engine was programmed to fire five times to inject the Telkom 3 and Express MD2 communications satellites into geosynchronous transfer orbit. "According to the currently available data, the third burn of the Breeze M main engine occurred as scheduled," said a statement released by Khrunichev, the Russian contractor for the Proton rocket and the Breeze M upper stage. "However, the engine was cut off within 7 seconds instead of after the nominal 18 minutes and 5 seconds." Engineers received a signal from the Breeze M stage in an unplanned orbit, according to the Khrunichev statement. U.S. Air Force tracking data indicate the rocket and its two passengers reached an orbit ranging in altitude from 165 miles to 3,118 miles with an inclination of 49.9 degrees. It was the second Breeze M failure in less than a year. The flight began at 1931 GMT (3:31 p.m. EDT) Monday with a successful liftoff from the Baikonur Cosmodrome in Kazakhstan. The Proton's three core stages flew smoothly, leaving the Breeze M engine to ignite five times before deploying the mission's two payloads more than 9 hours into the launch. Express AM4, another Russian communications satellite, was placed in the wrong orbit during a launch in August 2011 when that mission's Breeze M upper stage lost control of its orientation in space due to a programming error. Breeze M upper stages have flown successfully on 11 Proton rocket missions since August 2011. The next Proton/Breeze M launch was scheduled for Aug. 23 with the Intelsat 23 commercial communications satellite. 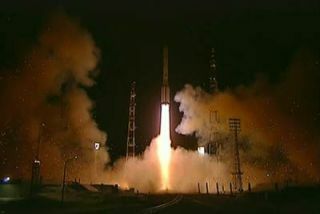 The Novosti news agency reported Russia is suspending Proton launches until experts determine the cause of the failure. U.S.-based International Launch Services oversees commercial launches of the Proton rocket. Monday's flight was conducted by Khrunichev. The Telkom 3 satellite was built by ISS Reshetnev with a communications payload provided by Thales Alenia Space. The $200 million satellite's 42 C-band and Ku-band transponders were to be operated by Telkom, an Indonesian communications firm, for broadcast and data transmission services. The 3,500-pound spacecraft was designed for a 15-year mission. Express MD2 was intended to relay data and communications across Russia. The craft was manufactured by Khrunichev and Thales Alenia Space for the Russian Satellite Communications Co., a state-owned spacecraft operator that serves Russia and neighboring countries. The Express AM4 satellite lost in the last Breeze M failure was also owned by RSCC. Copyright 2012 SpaceflightNow.com, all rights reserved.